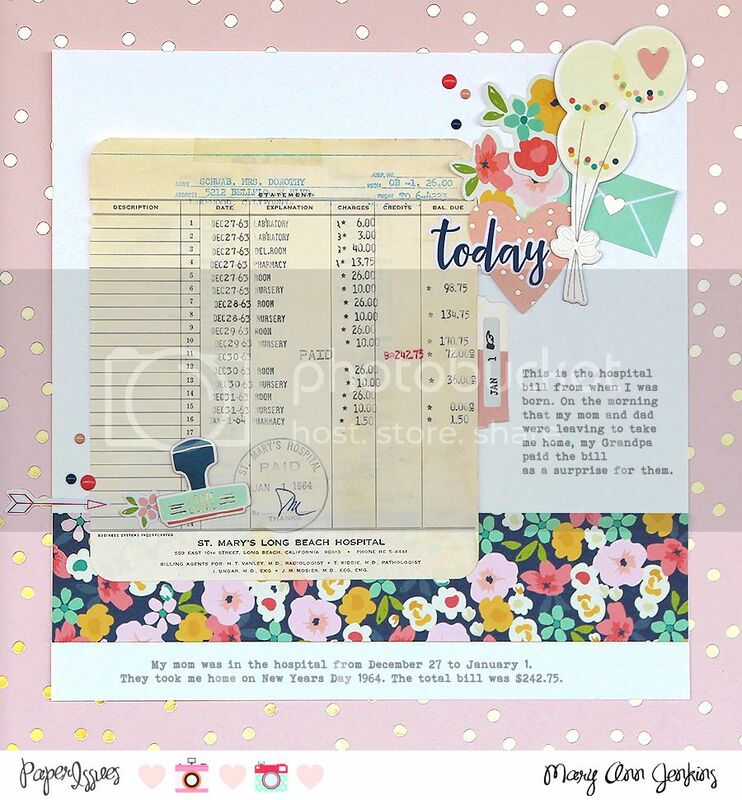 Here's another layout made with some of the Golden Days collection, part of the amazing box of wonderfullness that I won from Fancy Pants Designs!! I did lots of layering in a little cluster, mixing pieces of ephemera, a tag and puffy stickers too, then splattered on a bit gold mist, and finished it off with a gold glitter "&" sign I cut with my Silhouette. I just love the colors in Golden Days, perfect to use with old black and white pics or current photos like in this layout, it goes with everything!! Thank you again Fancy Pants Designs, I'm loving it all!! The leaves have finally started to change around here, now if the weather would just cooperate too! We are supposed to be in the low 90's this weekend, but I'm just going to ignore it and pretend that Fall has arrived ;) Even so, October really is my very favorite, and I've documented that with this cute set from Color Cast Designs that combines acrylic and wood veneer. Be sure to check out all the new releases from Color Cast, there's October, Fall, Thanksgiving and December Daily too! Today on the Paper Issues blog, we are spotlighting the fabulous Posh collection by Simple Stories! I really, really love this collection, lots of pretty colors...including pinks and navy blue, and lots of fun embellishment pieces. One of my favorite embellishments is the little chipboard rubber stamp piece. As you can see, it was just the right embellishment to use next to the date that was stamped on January 1, 1964, the day my mom and dad brought me home from the hospital. 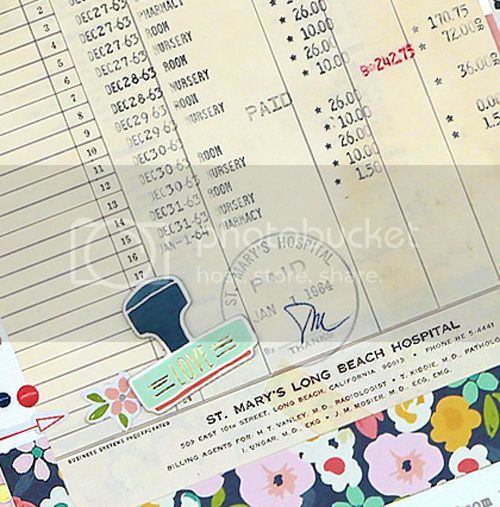 Notice too the amount of the hospital bill, $242.75, and that was for a 5 day stay!! As always, thanks for stopping by and remember to use code: Mary Ann in the Paper Issues store for 20% off your total purchase!! 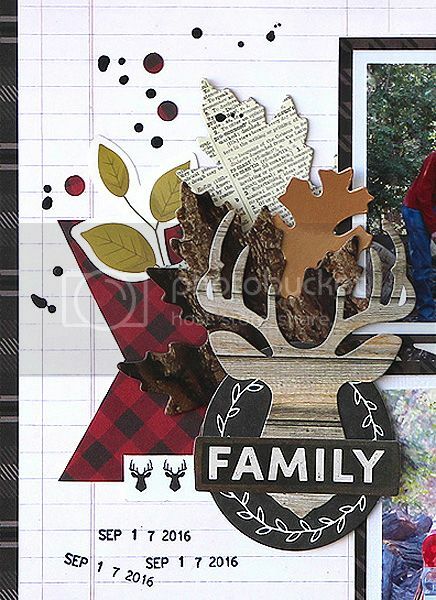 For my layout, I used bits and pieces from the ephemera pack, then layered on some of the accent Thickers and that arrow wood veneer. I also added in a few mustaches that I cut with my Silhouette. Since this was about my girlies mustache day at school, it had to have mustaches!! If you're loving the Take Me Away collection too, look for it in the Paper Issues store, and remember to use my code: Mary Ann for 20% off your total purchase!! As always, thanks for stopping by. Happy Wednesday! 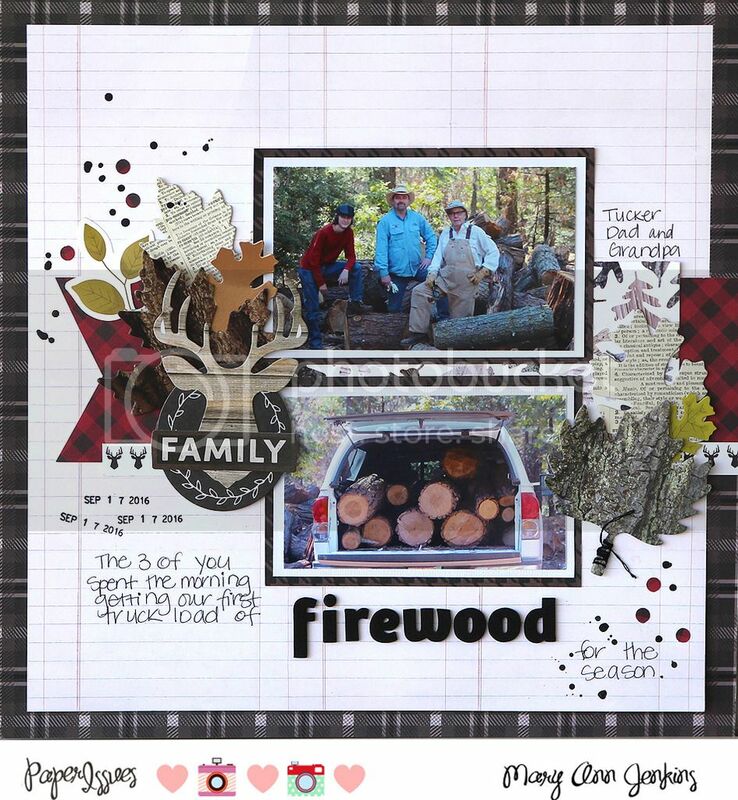 The October Take 5 Tuesday Challenge is up on the Paper Issues blog today! You all know the Take 5 Challenge is my favorite, and yes I played along too!! If you are new to Take 5, here's how it works: I give you a list of items to use as inspiration and a starting point for your project. From that list, you pick 5 items to use on your project. You can combine your own ideas too, but to play along you must use at least 5 items from the list. Sound like fun? For my layout, I used the color green, cardstock, arrows, 2 or more fonts, and splattered on a bit of mist. Remember the layout I shared yesterday? This picture was taken the same day, same place, but I made this one a girly layout with lots of flowers. Such a contrast from the "manly plaids" ;) but perfect to use for my Take 5 layout. Those cute little banner tags worked great for the two or more fonts category! Everything is from the beautiful Posh collection by Simple Stories, and is one of my faves right now, I just love the navy blue that is scattered throughout the collection! Have you played along with the Take 5 Tuesday Challenge yet?? You totally should, I'd love to see what you come up with. 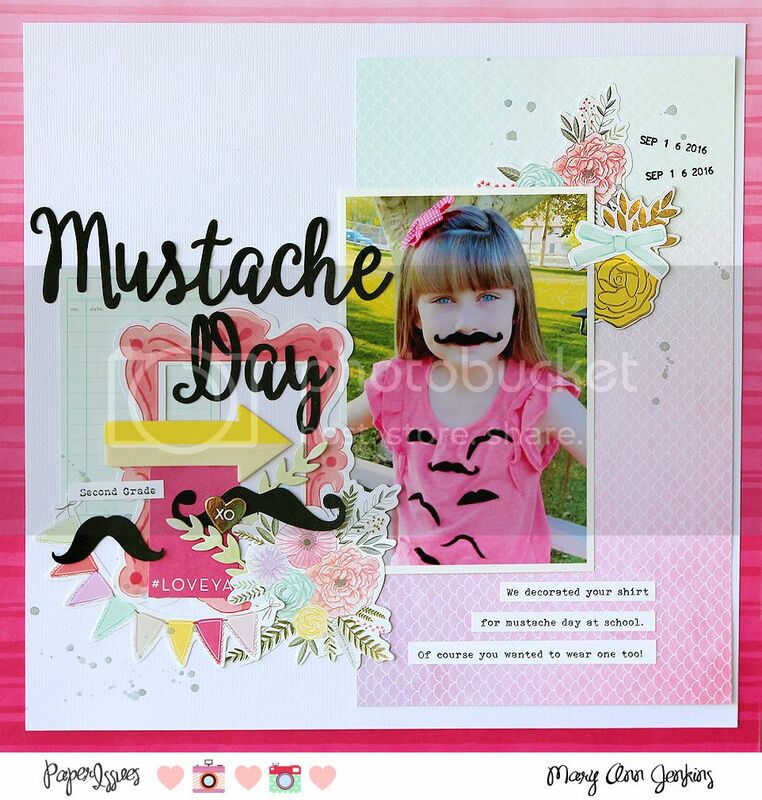 It's a great way to complete a layout, and you just might win a gift card to the Paper Issues store!! **Don't forget to use code: Mary Ann in the Paper Issues store for 20% off your entire purchase! !